- I have never had dog, Would be imprudent that me first dog was a American Pit Bull Terrier? It would have to give some type him of special education for to be an American Pit Bull Terrier? 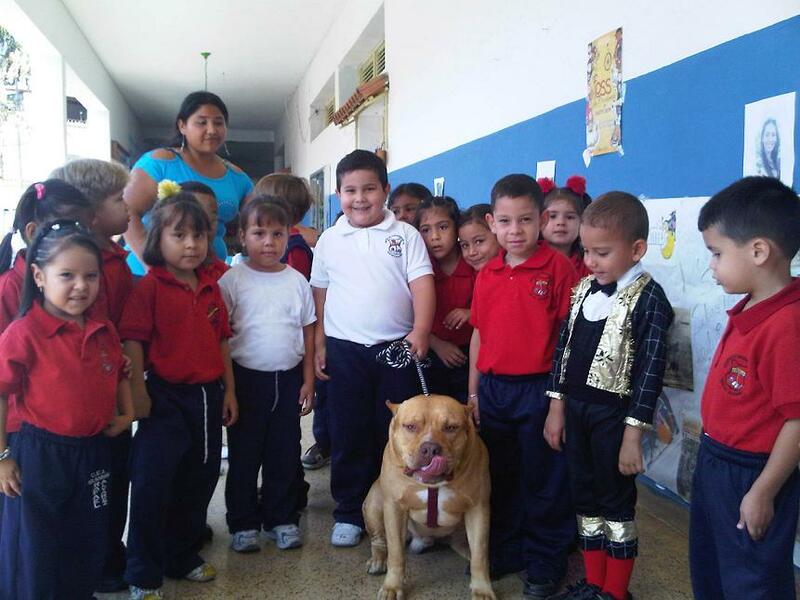 The American Pit Bull Terrier is a dog and it behaves like so, this we do not have to forget it. Observing very badly tried that is this canine race, on the part of Governmental Institution and mass media and much and badly that informs envelope she to the society, it is not to be strange to find people who when they speak of the APBT create that they are dealing with a wild animal or of any species less to the one than really belong, Familiar the canine species or Canis, that is to say, the best friend of the man from the beginnings of the humanity, protecting to him of wild beasts, to contributed food for their survival, and him to him to offered their company without requesting nothing to him in return. The really important thing at the time of deciding owning a dog or no, than the race to which it belongs or mestizos, more is to study that time we are going to be able to dedicate daily to the animal, if we have the adapted place to take care of to him and if the means of our surroundings are the adapted ones to firmly make the decision to have a dog or no, since this decision requires of much responsibility when being an alive being and so this entails. We must be honest with we ourself and to think if we are able to take care of the animalito suitably. After this, if our decision is the one to introduce a dog to our home, we must study more also we want so that it and that function we are going to give to him, than nothing to have a good base with foundation at the time of realising a good election of the race of the dog. In spite of the criticisms and than some they could think about which I expose here, I prefer to be bad before some, but to have brings back to consciousness calm of which what I have advised in this section is correct under my experience and point of view own with the dogs generally, for more than 40 years. 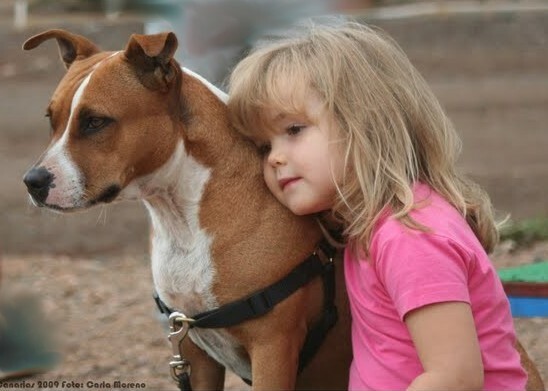 Although a dog has never had itself, if it suitably educates it to one in spite of being his first dog, is not going to have problems with the American Pit Bull Terrier. In order to suitably educate any type of dog, not only to the APBT, it must make him include/understand that send in house and to make him include/understand somehow what is correct and what it is not it. If to make understand something him in particular that this bad and animal does not want or it does not get to understand it with our words from regaño, the intensity of the same in relation to the size of the animal can be given him a cheek measuring and increasing the intensity of the chubby-faced cheek, in case cheek not affects him in measurement wished to do to include/understand him, that what it was doing was not correct nor the wished thing by our part and like leaders of the herd which we must be before its eyes, we are forced to indicate to him, guiding to him or educating to him it understands in such a way that it without no type of doubts, although we had to use the cheek, since of no to do it thus, we are confusing and giving the leadership to him of the herd, with the serious problems that this would repel for all the familiar scope. One can want much to its dog, but what it is not due to realise under any circumstance is to allow to him nor to humanize to him, since to do it, this occurring to the leadership of the herd (the head of the family) and that him is a terrible error that is committed quite often in the familiar surroundings and that it contributes serious consequences for the family and the own animal. In fact, the majority of the attacks of dog to people, is dogs allowed and badly educated and not of certain races since they have made believe means us. The animal must include/understand not even that hierarchic step of the herd or family and not in first belongs in the last to the family but, in means. From being this thus cannot get to even have fatal consequences, arriving to have to undo to us of our animal by not being able to control it. The error to that I am making reference within the education of the dog, is similar to the error that very frequently happens with the education that many parents give their children nowadays, who allow everything to them and when they want to make race of them or is too much behind schedule, a good cheek in time very fat problems had been avoided when the boy turns the 12 or 14 years. In addition with this way to act, the correct way is indicated to follow the boy and to the dog and we instilled the respect to them, a value nowadays that is enough in decay. I am of that they think that to the little tree he straightens himself to him of chiquitito, since if no, later the boy can remove to the knife or the dog to us to bite to us and not to have easy solution for this once arrived at this point. - How to begin to educate a puppy so that one does not behave aggressive of adult and that age is the suitable one to take it to a trainer? As far as the education of the puppy, I do not recommend to take it to any trainer, because he is the proprietor who must educate the animal and make him understand that the proprietor and all the components of the family are the herd heads and that hierarchic step is pertaining of that herd but in the last. 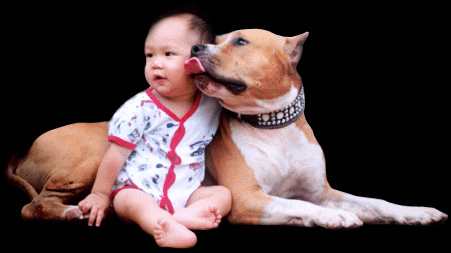 As much the APBT as to any other dog of any canine race, one is due to begin to them to educate from small, even from the life month and a half, but fighting them in agreement with the age that it has. If regaño is not sufficient, will have to give a cheek him and if with this it were not enough either and depending the age on the puppy, it will have to be used more thoroughly in the cheeks, because it is the way of which the animal understands that this not doing the correct thing. He is advisable before giving a cheek him, to make a warning noise of which it does not do the correct thing, and if the puppy after to have warned to him with this continuous noise doing badly is the moment of the cheek. This way, the puppy would assimilate that warning noise this reprimanding to him by which this doing badly and also assimilated that if does not stop to make the prank, immediately will be slaped. This type of education is the correct one for any type of dog requires that it, under my point of view, in addition we secured three very important things; first it is to educate our animal, second is to make include to the animal his hierarchic scale in the family or herd, that by all means always will have completes to be it and finally, we obtained that the animal not only wants to us, if not that it adored to us, because all the animal from puppies look for that guide to them in their way and realising this type of education, the puppy quickly will know that guides to him and it educates to him, therefore will have to us at least like heads of herd or like heads of. This type of education, is the one that it avoided in the future which the adult animal has strange behaviors with the people or the owners, whom danger for the integrity of the person without reason some, because entails almost all the dogs that attack the people, are of the race that is, were dogs of familiar house badly educated, because absolutely everything was allowed to them and an allowed dog is a potentially dangerous dog. I have to say, that during my more of 40 years ago coexisting with dogs of all type of breeds and since 25 years ago exclusively with American Pit Bull Terrier, I have had to apply the chubby-faced cheek in counted occasions and concretely with the American Pit Bull Terrier, only in two occasions of the hundreds of them who have happened through my hands, being the canine race less given to have to use the physical punishment, since they are extremely intelligent showing a great nobility by nature and this facilitates to them enormously, the learning of a correct education for its behavioural behavior arrived the period from adult. - My dog has been allowed or badly educated, and for a time, he has begun to have an ugly attitude towards the people, What can I do? Allowing in everything or almost everything to a dog, is of the race that is, is the original cause of the problem. What the dog needs is education and nontraining, they are things that nothing they have to do one with another one and people confuse very lightly. The training it can realise the owner if it has knowledge and also a professional trainer can realise the training. The education on the contrary, only can realise it the owner, since after all it is in the home of his proprietor where it is going to coexist and no matter how much it educates a trainer to him, the really necessary thing is that education shows received it in house of its proprietor and not in the one of the trainer. By this same, when to educate it talks about, best one is than it realises the proprietor of the animal and in case the proprietor does not know like doing it, he would have to look for professional advising, but the education of its dog would be due to contribute he stops to strengthen before its dog the herd leadership. Like educating its dog? Like the human beings, from small the education occurs them bases since with adult age he is quite dangerous for the physical integrity of the proprietor, if the animal or especially thinks that she is the head of herd or family. If the animal considers itself to be in that hierarchic scale, bad subject, if not outside too greater and its character were even castable, it can be that this in time to even re-educate it. If this is thus, it is due to make include the animal that is the good thing and what he is the bad thing, and regañar to him very sharply and resolutely and if continuous in the persistence of not doing the correct thing, then him a chubby-faced one is due to offer, to make understand him that is the head of herd or family. This can sound violent and hard, but the education of the animal in this sense, in the end will be much more hard when is not directed it must sacrifice so that no longer race is made of. What one is never due to allow a dog, he is that gruña or it tries to attack to a person of the family or friend, or even if he is a stranger but it did not give reason him to attack it or to try to attack it, as the saying goes “To the little tree it is straightened to him from chiquitito”, it is reason why much taken care of at the time of trying is due to have to educate it in the indicated sense, so that it could be that the animal has or so ingrained the hierarchy of head of herd or family, that reacts aggressively towards you or the person who I offer the chubby-faced one to him bites and it. If it is included/understood that when regañar to his dog with a cheek, this reactionary aggressively towards the educator, which already I would only have left to recommend is the sacrifice of the animal before she is too much behind schedule and it happens a very serious accident, del that soon would regret it not to have sacrificed before.